Once you get lemon balm started growing in your yard, you will find it grows so fast during the summer months, that you soon cannot make good use of all of it. Unlike sage and rosemary, herbs that preserve well, lemon balm loses much of its potency in the drying process. 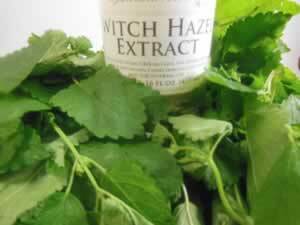 Preserving lemon balm in witch hazel enhances the skin restorative properties of both elements. Use anytime you would use plain witch hazel, to sooth and tone skin, stop itching and encourage healing from cuts and scrapes. Clean lemon balm leaves from the stems, then tear into pieces, bruising the leaves slightly in the process to stimulate the release of the essential oil. Stuff loosely into a clean, dry jar leaving an inch or so of headroom. Cover with witch hazel, making sure all the leaves are submerged. Let sit for a least a couple of weeks, then strain into a clean jar. The finished product is a pale golden color with a lovely lemony scent. Dilute with and equal amount of distilled water to use as a body spray or facial toner.